Hygge (pronounced Hue-Gah) is a quality of coziness and comfortable conviviality that engenders a feeling of contentment or well-being. Some elements include coziness, being present in the moment, taking pleasure in small things, embracing equality, and expressing gratitude. It’s all the warm fuzzies of the season without the stress! 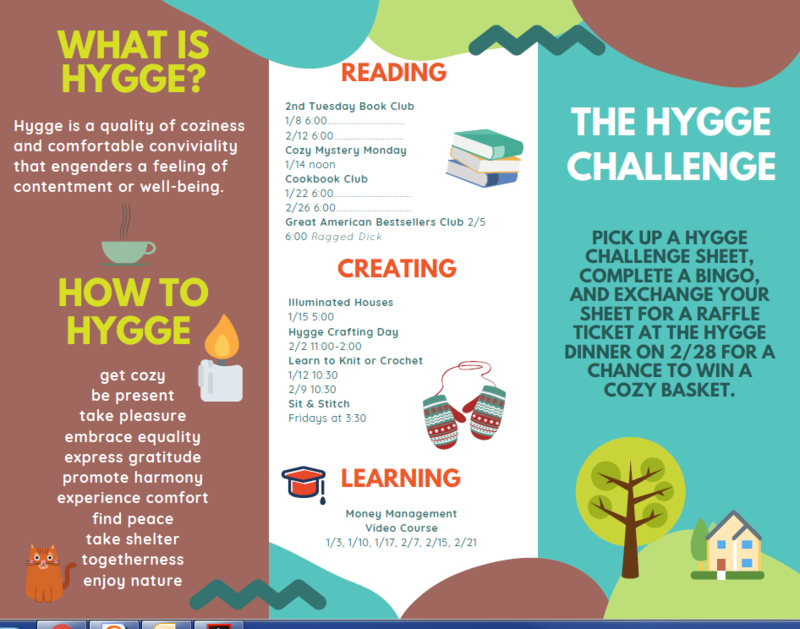 From January 1st to February 28th, we are celebrating the Danish concept of Hygge with: 1) Hygge Bingo Challenge: Pick up a Hygge Bingo Challenge sheet on the 1st floor of the library. Each complete bingo can be exchanged for a raffle ticket for a cozy basket at the Hygge Dinner. 2) Reading contest: Pick up a reading log on the 1st floor of the library. Each book you read will be an additional entry into the drawing for a cozy basket. 3) Hygge Dinner: Celebrate the end of the 2019 Winter Reading Challenge with a Hygge Dinner at the library Thursday, February 28 at 5:30PM. Bring your reading log and hygge challenge sheet as your entry for the cozy basket drawing. Participants are also asked to bring a dish to share with others. Registration is required and can be done here: https://goo.gl/forms/FdMlNEU0yNI6TxMx1 Don’t forget our other Hygge activities! We will be talking cozy mysteries, making Illuminated Houses, having a Hygge Crafting Day, and so much more! Pick up a full list of our January Adult Hygge activities at the library. Keep cozy! Have hygge and fun! We / Biblioteket Sønderborg might copy Hygge winter Reading next year. We do have Bingo Reading 12 months-win a basket. Dinner and Reading logs are true hygge!